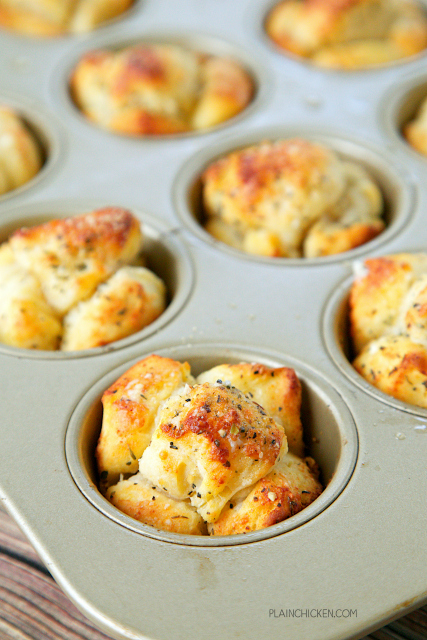 Parmesan Garlic Monkey Bread Muffins - only 5 ingredients and ready in 10 minutes. Refrigerated biscuits, butter, Italian seasoning, garlic and parmesan cheese. We ate way too many of these! SO good!! Serve with some warm pizza sauce! 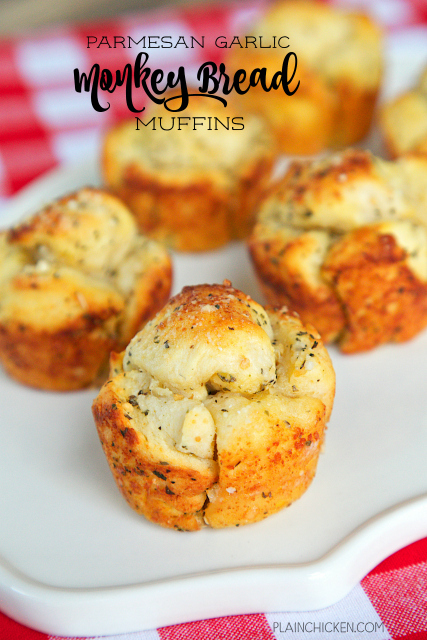 We served these Parmesan Garlic Monkey Bread Muffins with the Meatball Lasagna I shared yesterday. They were crazy good! I could have made a meal out of them. They are dangerously delicious! They are also very simple to make. Cut up refrigerated biscuits and toss them in butter, garlic and Parmesan cheese. They smelled amazing while they were in the oven. We both ate WAY too many of these!! It was worth every single calorie. YUM! Preheat oven to 400ºF. Spray a 12 cup muffin pan with cooking spray. Cut each biscuit into 8 pieces. Place pieces in bowl. In a small bowl. combine 4 Tbsp melted butter, Italian seasoning, garlic and 2 Tbsp parmesan cheese. Pour butter over biscuit pieces and toss to coat all pieces in the butter mixture. Place biscuit pieces into prepared muffin pan. Sprinkle with remaining 1 Tbsp of parmesan cheese. Bake for 8 to 10 minutes. Remove from oven and brush with remaining 2 Tbsp melted butter. What form of garlic did you use (powder, minced, etc.)??? I had the same question, about the garlic. Fingers crossed for a speedy answer! How many biscuit pieces per muffin tin?